My first knitting project was nine months ago. Nine months! I haven't shared anything about my "knitting life" here on the blog, but today I am changing that. 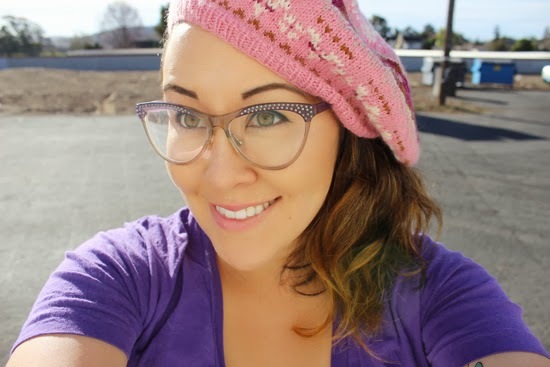 Let me introduce you to Victory, a 1940s style beret pattern designed by Tasha at By Gum By Golly. I'm not going to lie, when I first saw the pattern I was initimidated. Other than an easy color work beanie from one of Stefanie Japel's Craftsy classes I didn't know a thing about this style of knitting. 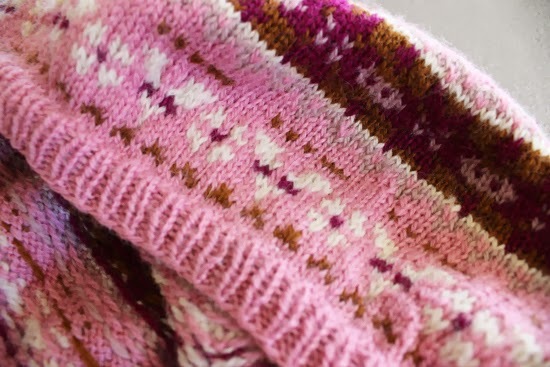 Thankfully, Tasha hosted a knit-along for her pattern with really really helpful information. If anyone out there is interested in learning color work I highly recommend learning with Tasha's pattern teamed with her knit along posts! Knitting with two balls of yarn was a struggle at first and the stitches at the beginning of the hat are far from perfect. I wasn't sure how to to hold the yarn and how to have consistent tension. In the end I held one strand of yarn in my left fingers with the ball of yarn on my left side and one ball of yarn on the right side with a strand of yarn in my right fingers. Keeping everything separate was really helpful because it prevented tangles. Originally I was a British style knitter, but after this project I can kind of knit continental too! Blocking this was pretty fun. I soaked it in lukewarm water for about a half hour and then carefully soaked up the excess water with a towel. 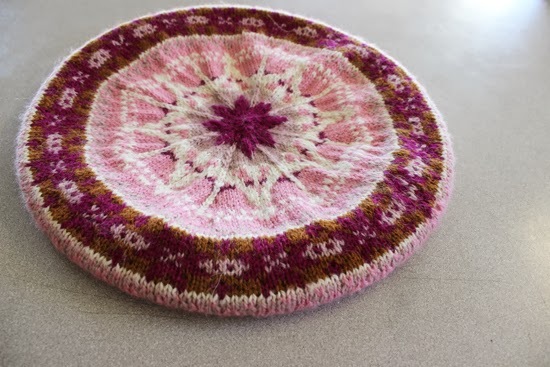 To get the beret shape Tasha recommended blocking the hat on a 10.5 inch dinner plate. Luckily, our dinner plates at home were the perfect size and I let it sit overnight. 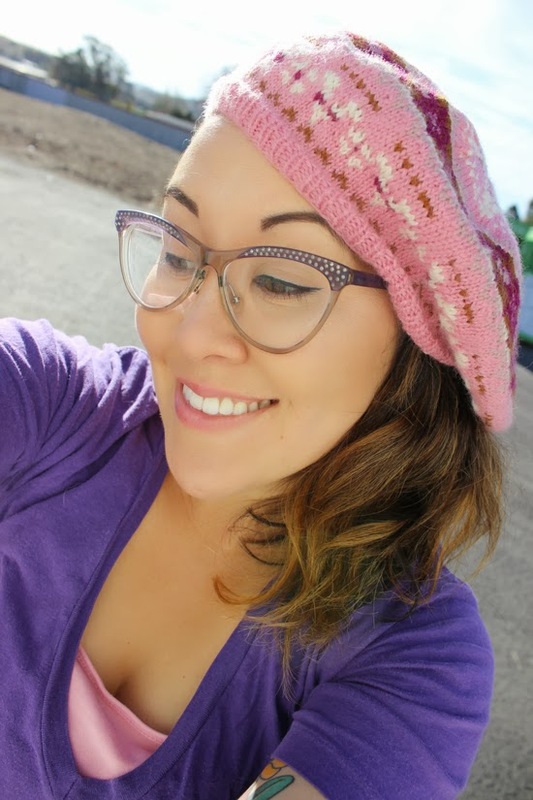 Finishing this beret has been such a boost of confidence and I feel much more comfortable tackling new techniques. What are you waiting for? Go get this pattern!!!! This is amazing! I'm so impressed. I'm a bit scared to try colourwork myself, but when I work up the courage this is definitely the first pattern I'll try. Just gorgeous! Thank you! I would love to make a sweater like your MIL made you. It's so cute! Cathy, it's different from the other knitting I have done and it's super satisfying. Is that weird to say? I think using multiple yarns made me slow down a bit and enjoy the process. Love it Erin, you did such a beautiful job! Ahh so pretty! I am dying to try colourwork but haven't yet. I reckon one of the hardest things will be deciding on what colour combination to use! Yours is a really different look to the pattern and I really like it. Well done! How cute are you?! I can't believe you just started knitting and you already made this amazing hat! well done- It looks fab! This beret is fabulous! I never would've pictured it with these colors, but holy cow, it's awesome! And the pink is SO beautiful with your complexion and your eyes! Gorgeous!! It looks really pretty, Erin! And lovely photos! You are just beaming! It's beautiful!! 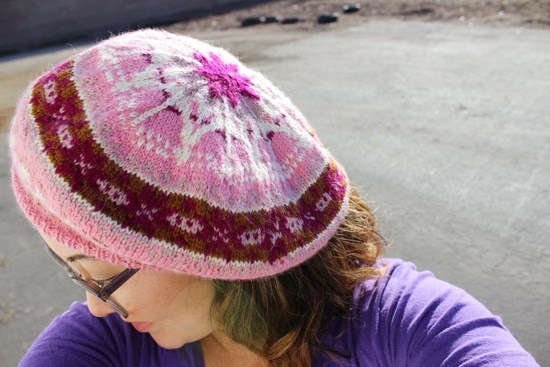 This really is a great hat for practicing colorwork! So pretty, pretty, pretty!! I love that it's pink! Far from perfect? I think you're closer than you think! The hat looks great and the color work is awesome. Interesting tidbit about blocking over a dinner plate! Wow! 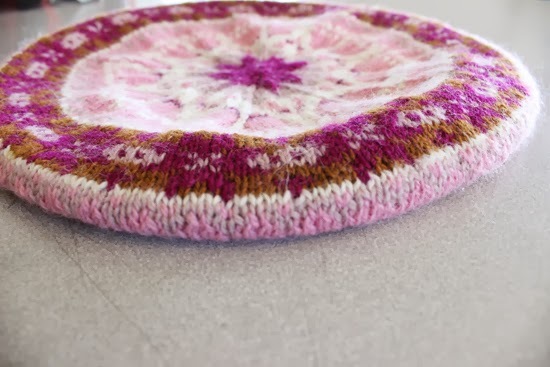 This is such a gorgeous beret!! 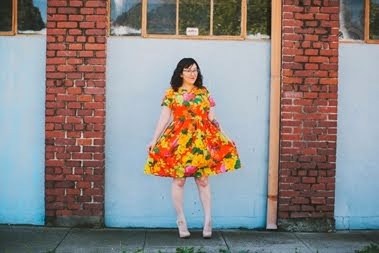 I love the pattern, and the colors you chose are just soooo sweet!! I am just learning how to knit, and color work definitely intimidates me! Figuring out which colors to use was pretty difficult. I think I ordered eight skeins (three more than necessary), so I could see all the colors together. Thanks, Sallie. When you are ready to start color work I highly recommend Tasha's pattern.